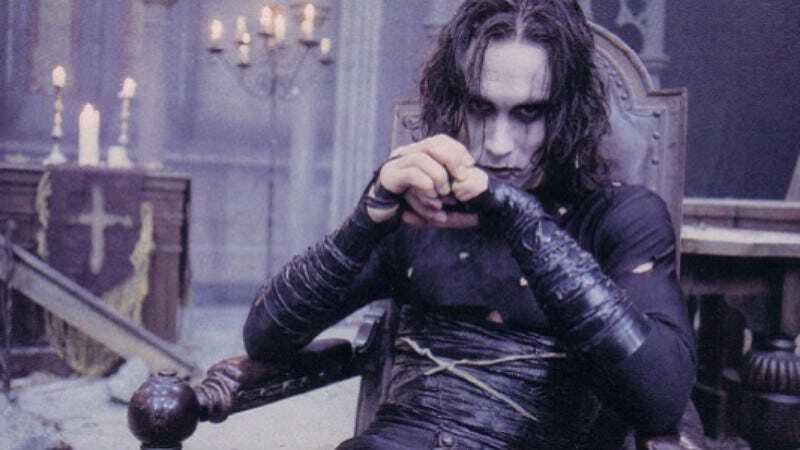 The Crow is unusually morbid for an actor’s final film; it begins with a crime scene’s bloody aftermath, and the first time the audience gets a good look at Eric Draven (Brandon Lee), he’s clawing his way out of his own grave. However ghoulish, it makes a kind of sad sense: Lee, the son of martial arts legend Bruce Lee, died during the making of the film, killed by a prop gun misfire on set. The film, which was only a few days away from wrapping principal photography, was completed using some rewrites, editing tricks, a stand-in, and special effects, and released in 1994, resurrecting Lee’s final film work. Based on the James O’Barr comic, The Crow follows a story so simple it doesn’t generate suspense so much as an extended pulpy reverie. Draven, a local musician, and his fiancée Shelly (Sofia Shinas) are attacked in their apartment by a vicious gang; she’s raped and murdered, while he gets thrown out of a window to his own death. A year later, he rises from the grave, applies clownish makeup and, assisted by a magical crow, gets revenge on their attackers. It all takes place in a city that is supposed to be a version of Detroit, but more resembles a Gotham City long abandoned by its Batman. Director Alex Proyas would go on to create an even more intricate world with Dark City; The Crow is a simpler and less imaginative movie, but a similarly otherworldly distillation of cinematic cityscapes. In case it didn’t look enough like a music video, Proyas actually has the resurrected Draven play electric guitar on the roof of a building overlooking the crumbling-gothic cityscape, notes wailing in beautiful agony. And in case the movie’s teen-goth sensibilities were at all in question, Draven’s transformation via makeup is scored by a song from The Cure. Yet, despite the opportunity for truly epic self-pity, The Crow isn’t a complete mope-fest, thanks in large part to Lee. He shows great control of the character’s operatic comic-book physicality, not just in his rooftop leaping and fight scenes, but the way he carries himself. Lee uses the deep, enunciating voice of a rococo comic-book villain, and in his makeup looks a bit like the Joker, matching the production design that recalls Tim Burton’s Batman movies and that character’s ’80s and ’90s comics. Like a lot of Batman-related characters both heroic and villainous, Draven comes from a place of anger and despair, but approaches his vengeful tasks with showmanship, even charisma. Whether it was an artistic choice or one made by necessity given Lee’s tragic death, the “real” Eric Draven is more of a suggestion than a character; the resurrected version dominates the movie. The Crow makes it sadly easy to romanticize Lee’s real-life death, but it’s also a strange, affecting pop memorial. Availability: The Crow is available on Blu-ray and DVD from your local video store/library. It can also be rented or purchased from the major digital services, and is currently streaming on Netflix.